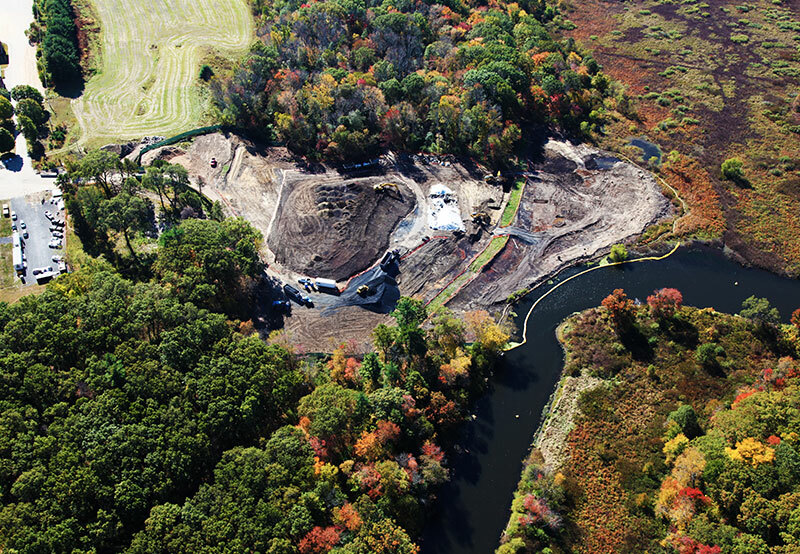 Spearheaded by the Massachusetts Department of Capital Asset Management and Maintenance (MassDCAMM), the Charles River Gateway project replaced a hazardous metals and asbestos impacted debris field with a picturesque public park along the Charles river, equipped with a canoe launching dock and public trails. The buildup of debris and various waste on the site began in 1986 when the Medfield State Hospital first opened. The hospital, which functioned in a time when the mentality towards waste was “throw it out back”, improperly dumped and buried contaminated materials and debris along the Charles River. As a result, by the time the hospital closed in 2003, the landfill had reached depths of 15 feet. 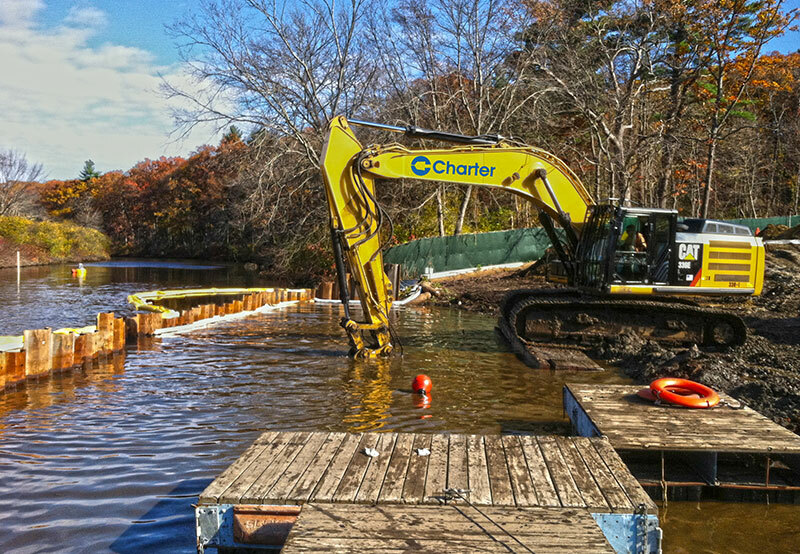 Charter executed the work to restore the land by excavating, relocating and capping asbestos impacted sediment; removing, stabilizing, and disposing of soils from hot spot areas; dredging, dewatering, stabilizing, and disposing of impacted sediments; sheet pile installation for turbidity control; and controlling the Charles River water flow with temporary earthen berms and super sacks. 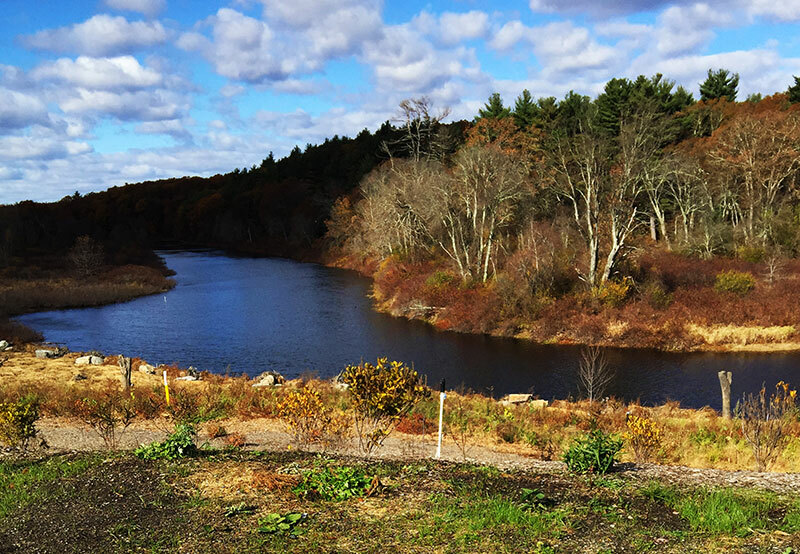 Located along the Charles River, the former disposal area threatened the water quality, the surrounding watershed, and a town well and aqueduct. Through 6 years’ worth of discussions, mediation, and compromise, DCAMM and the people of Medfield overcame challenges and developed a plan to create this community greenspace that everyone could be proud of and enjoy. As William Massaro of the Town’s Negotiation Committee said, “It’s taken a while, and a lot of hard work by many people. It’s a riverfront restoration everyone can be proud of. The majority of the area is going to look like it did a hundred years ago. It will be an asset for the river and its users”. 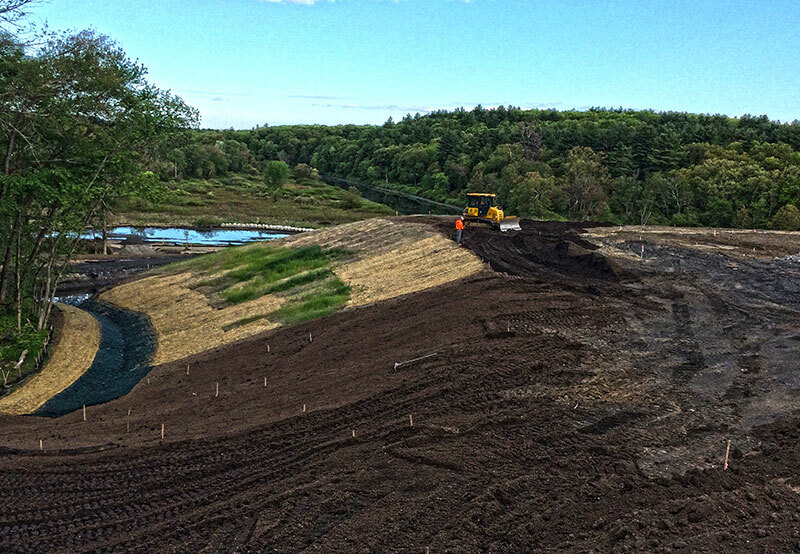 The final product was embraced and celebrated by residents for offering a compromise that removed the threat of contamination, generated 4.5 million gallons of flood water storage to mitigate flooding down river and created 4 acres of public park and 2 acres of essential wetland habitat tied into the Charles River Link Trail. The Environmental Business Council (EBC) of New England, has announced the winners of the annual EBEE Awards. Charter is a part of the incredible team that was awarded the Nicholas Humber Environmental-Energy Award for Outstanding Collaboration. In construction, allowing yourself to become content with safety standards can become deadly. Even when working on the same job site, environments are constantly changing as the project progresses; a skipped equipment check or forgetting to reevaluate your surroundings, can lead to major injuries.